Does your organization have a community-based outreach or educational project aimed at improving health and safety of agricultural workers or rural populations? Have you ever considered applying for a pilot grant to help fund your work and test new, innovative, outreach methods? 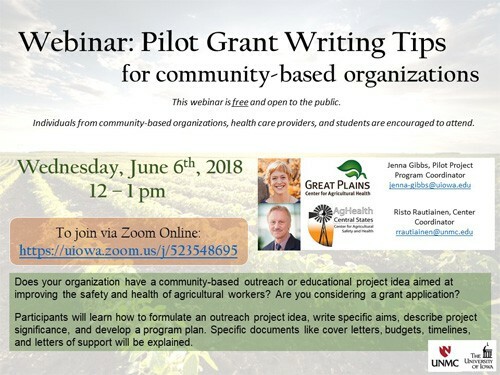 The Great Plains Center for Agricultural Health and the Central States Center for Agricultural Safety and Health are co-hosting a webinar, Pilot Grant Writing Tips for Community Based Organizations. This one hour webinar is free and open to the public. Participants in the webinar will learn how to formulate an outreach project idea, write specific aims, describe the project’s significance, and develop a program plan. Specific documents like cover letters, budgets, timelines, and letters of support will be explained. This workshop will be co-hosted by Dr. Jenna Gibbs and Dr. Risto Rautiainen. Dr. Gibbs is the current pilot project coordinator at the Great Plains Center for Agricultural Health at the University of Iowa, and Dr. Rautiainen is the current Center Director of the Central States Center for Agricultural Safety and Health at the University of Nebraska. Both programs offer yearly pilot grants to community-based organizations working to improve the health and safety of agricultural workers. Please note: This workshop will be most informative to individuals who work in agricultural safety and health, since most examples will highlight activities to prevent injuries and illness in the agricultural working population. However, regardless of your background—the grant writing tips may be very informative. All are invited to attend!